The name may have changed , but otherwise India’s southern centre, the capital of Tamil Nadu, seemed scarcely changed even though I haven’t been there for a long spell. 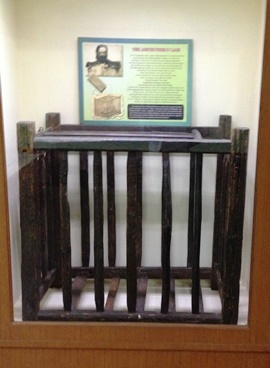 ◄ Top of my plans for my return visit was to check out Anstruther’s Cage at Fort St George. In 1840 Captain Philip Anstruther of the Madras Artillery was ‘surveying’ in China when he was captured, ‘hammered on the kneecaps,’ carried away to Ningbo (only about 150km from Shanghai) and crammed into a small wooden cage. ‘In spite of his cramped position,’ the museum exhibit reports ‘Anstruther managed to sketch what he saw. His drawings pleased his captors so much, that they allowed him a larger cage.’ There’s no mention of how he acquired his art materials and ‘larger’ didn’t seem to mean very much larger. In the smaller and larger cage he was confined for over five months before being released and carried on a palanquin (after all that time you’d have thought he’d have wanted to walk?) to the coast from where he sailed back to Madras on HMS Blonde, taking the cage with him as a souvenir of his travels. In 2005, travelling through China, I spent a night at Ningbo, where Anstruther was imprisoned, and then took an overnight ship to Shanghai, probably passing through the same port from where Anstruther departed back to Madras. The First Opium War was underway in 1840, Anstruther’s ‘surveying’ was probably not so innocent. There’s a self-portrait of the remarkably ugly Anstruther with the cage. It’s said he always carried a gold coin which had been presented to him by another ugly gentleman because he was so impressed to bump into somebody even uglier. ▲ Broad Lands, the ‘hippie hotel’ where I stayed back in 1986, when Chennai was still emphatically Madras. Absolutely nothing has changed in the intervening three decades, right down to the sign at the front. Clearly that effusive welcome worked back in the hippie trail era, I stayed there on that one occasion and really rather liked it. I remember meeting a Dutch traveller there who commented that he was from a country where people seemed to have a natural aptitude for languages, but even for him Tamil was a real challenge. It’s another of those languages with a script that looks rather like the language sounds, it’s all bubbles and circles, swirls and whirls and the language seems to bubble along as well. Times have changed, there are no hippies, or anybody else for that matter, staying at Broad Lands today. 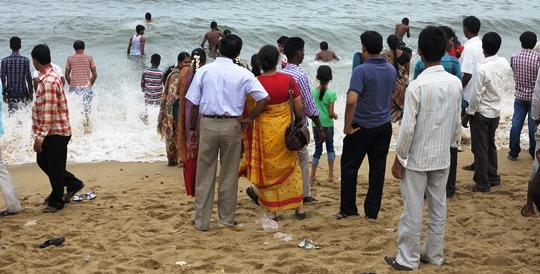 ▲ I walk along Marina Beach for a spell, there are a lot of people in the water, most of them fully dressed. Nobody is going out more than a few metres from the shore, despite which I reckon they must lose a few every year. The water’s rather rough. The crowds are even greater on the beach, crowding right down to the water’s edge. Plus there are horses, kid’s fairground stuff, a balloon-shooting gallery, food, all sorts of entertainment and at least one dead dog, stretched out on the sand. 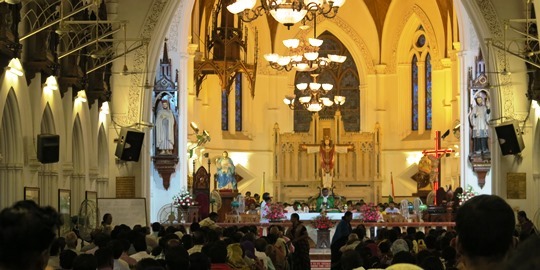 ▲ On a Sunday night San Thome Cathedral is surprisingly busy and very colourful. The cathedral features the tomb of St Thomas the Apostle, the ‘Doubting Thomas’ of the New Testament. He is reputed to have brought Christianity to India and for his troubles was killed in Chennai, probably by accident although the legends prefer that it was a heroic martyrdom. Somehow or other most of his remains made their way to Italy, but there is a fragment of bone left here. ▲ Once I’ve checked my chappels at the chappel-checking counter I can enter barefoot for a music and dance performance at the Kapaleeshwara Temple. The best examples of the vividly coloured Tamil temples of South India are further south, in towns like Madurai, but with its flamboyantly decorated entrance gopuram this is a very good substitute.